Ava DeMarco and Rob Brandegee had a simple, yet revolutionary idea – design and manufacture trendsetting purses and belts using recycled materials. Rob was an undergrad student in an Honors College Entrepreneurship class taught by IEE Founder Ann Dugan. Rob wrote the business plan for Little Earth as his class project in 1993 and the rest is history. Not only were they first in the market with “ecofashion,” but with the holistic approach to business start-up and expansion deployed by the IEE, they went from designing, making and distributing the products from their home, to building a multi-building complex. NOW, Little Earth has distributors and customers in seven countries, including Japan and Germany. The IEE continues to be a steady hand of support for the growing company and has recently helped them obtain additional business growth funding. 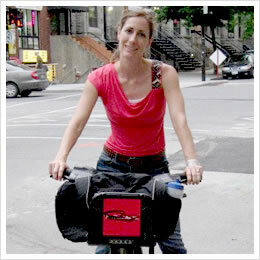 An avid cycler, Sara Petyk launched Bike-the-GAP.com in an effort to connect more people to the thrill of biking the Great Allegheny Passage – a recently completed bike trail stretching over 300 miles from Pittsburgh to Washington, D.C. With much excitement about the Passage and increased popularity in biking, Sara hit the pavement at the right time. However, as a one-woman operation, she needed to find ways to capitalize on the opportunity. The Institute worked with Sara on business expansion and marketing through the development of a strategic business plan that included identifying funding opportunities. As a result, Sara was able to receive the growth capital she needed from various financial sources. Thanks to the Institute, 2013 was a year of acceleration for Bike the GAP.